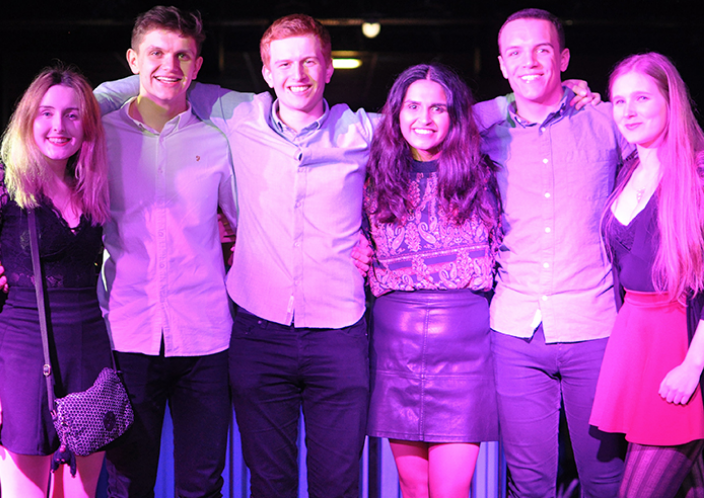 On Friday 8thof March, the Students’ Union Full-Time Officers’ Team 2019/20 was announced. First to step on the podium of victory was Ben Evans for the role of Vice-President Activities. He was followed by Bee Morgan – Vice-President Education, Lewis Marriot – Vice-President Campaigns & Communications, Hannah Prydderch – Vice-President Union Development, and George Nuttall – President. The SCAN Team approached all candidates on the night to ask about how it felt to have won after two long weeks of campaigning. There seemed to be a mixture of emotions which embraced both shock and happiness. The Vice-President Activities Elect stated that a “weight had been dropped off his shoulders.” His top priority for the year will be making sure that that the whole sporting and societal offer across the board benefits from the current Sports’ Union situation. The Vice-President Education Elect, Been Morgan, one of the very few women to have been elected in this position, told SCAN she felt truly elated and excited to begin her new role. Her first priority of the year will be tackling the 6-7 timetabling issues and university tuition fees. Lewis Marriot, newly elected Vice-President Campaigns & Communications, on the results’ night told SCAN he is determined to provide more support to Student Media bodies starting from the beginning of the next academic year. Following a very intense battle between two former College Presidents, Hannah Prydderch was elected Vice-President Union Development. When approached by SCAN, she mentioned being “speechless for once in my life. I’m excited for the year ahead and to work with my fellow Officers.” Her top priority for the year will be working with College JCRs due to their importance here at Lancaster, as well as cooperating with the Post Graduate board. Continuing, Grishma Bijukumar was elected Vice-President Welfare & Community. She told SCAN about her intense campaign and how her victory felt surreal. Thinking about her top priority for the incoming year, she highlighted how all issues within her field are equally important. However, given the current circumstances, she believes that liberation groups should have priority at the moment. She also mentioned wanting to get rid of sexual misconduct at University. The Union then proceeded to thank all the staff who worked on elections, the candidates, the Colleges, and every single voter who decided to use their right to vote in this election. The SCAN team would like to thank all successful candidates and wish them the best of luck for their year ahead.